Envaya is a free, easy-to-use service that allows civil society organizations to create their own websites, publish their latest news, photos, and documents, interact with grantmakers, and collaborate with other organizations and people around the world. Over 700 civil society organizations (CSOs) are already using Envaya, from small community based organizations to large NGOs. CSOs on Envaya work on a wide range of activities including advocating for positive change, developing new approaches to poverty reduction, and running projects that range from leading HIV/AIDS education programs to planting trees. Easy-to-Use: To make a website on Envaya, you don't need any special computer training or equipment. In about five minutes, you can set up a home page for your organization yourself. Free: Hiring someone to build and host a website for your organization can be expensive. Envaya is free. Mobile: Envaya is optimized for the mobile web, so your website is accessible from any web-enabled mobile phone. Visible: Envaya links your website into its network so that anyone - including grantmakers - can easily find you when they are looking for civil society organizations like yours. Translated: Envaya is translated in Kiswahili and English, so you can use whichever language you prefer. When somebody visits your site who can't read your language, Envaya will translate your content into their language. Collaborative: Envaya lets you see what other organizations are up to, send them messages, and engage in discussions together. If an organization hundreds of kilometers away has a successful project and writes about it on Envaya, you can get ideas for your own organization. 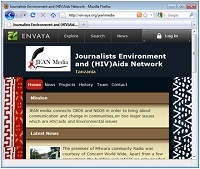 Currently, Envaya is available for civil society organizations in Tanzania and Rwanda. If you are a representative of a civil society organization that hasn't yet registered for Envaya, sign up now! For more information on how to register for Envaya, continue to the next page.